Farrar, Straus and Giroux, 9780374158613, 272pp. Bev Tunney and Amy Schein have been best friends for years; now, at thirty, they're at a crossroads. Bev is a Midwestern striver still mourning a years-old romantic catastrophe. Amy is an East Coast princess whose luck and charm have too long allowed her to cruise through life. Bev is stuck in circumstances that would have barely passed for bohemian in her mid-twenties: temping, living with roommates, drowning in student-loan debt. Amy is still riding the tailwinds of her early success, but her habit of burning bridges is finally catching up to her. And now Bev is pregnant. As Bev and Amy are dragged, kicking and screaming, into real adulthood, they have to face the possibility that growing up might mean growing apart. 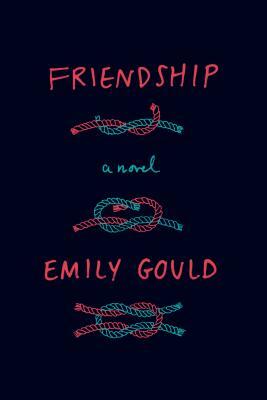 Friendship, Emily Gould's debut novel, traces the evolution of a friendship with humor and wry sympathy. Gould examines the relationship between two women who want to help each other but sometimes can't help themselves; who want to make good decisions but sometimes fall prey to their own worst impulses; whose generous intentions are sometimes overwhelmed by petty concerns. This is a novel about the way we speak and live today; about the ways we disappoint and betray one another. At once a meditation on the modern meaning of maturity and a timeless portrait of the underexamined bond that exists between friends, this exacting and truthful novel is a revelation. Emily Gould is the author of And the Heart Says Whatever and the co-owner, with Ruth Curry, of a feminist publishing startup, Emily Books, which sells new and backlist titles via a subscription model. She has written extensively for many publications, including The New York Times, The New York Times Magazine, MIT’s Technology Review, Poetry, the London Review of Books, n+1, The Guardian, The Economist, Slate, and Jezebel, and was an editor at Gawker in 2008. She is best known as a blogger, having maintained a popular online presence since 2005 at Emily Magazine. She lives in New York.